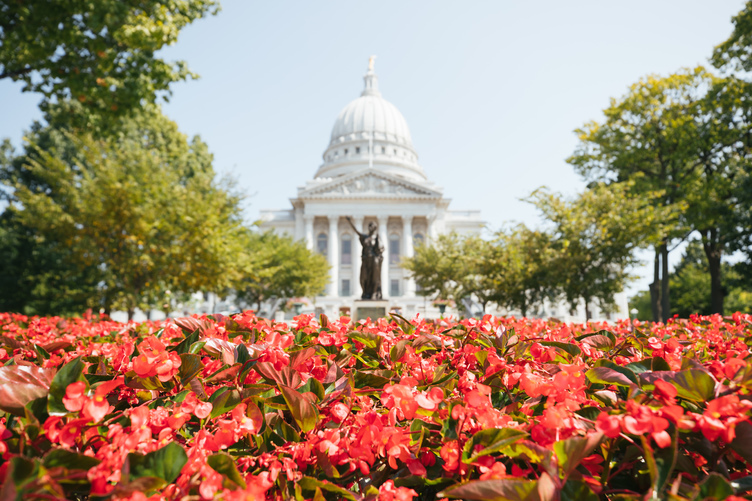 Wisconsin’s capital has a shimmering lakefront, amazing farmers markets, lively street performers, a dizzying diversity of restaurants, and standout Frank Lloyd Wright architecture. It’s also a famously fun college town, with so many performance venues—opera houses to chamber orchestras, outdoor amphitheaters to historic Art Deco theaters—it’s hard to believe this small Midwestern city can fill them all. But fill them, Madisonians do. To give you an insider’s look at this energetic small city, we asked the locals what to do when you visit. Here are a few favorites. For dinner and a show, locals recommend starting at Madison Museum of Contemporary Art’s rooftop restaurant, Fresco, which looks out over the Capitol dome, the city skyline, and neighboring theaters. Among them, the city’s oldest theater, the Orpheum, which was restored and reopened in 2016 with a giant new 2,000-lightbulb sign—a gleaming replica of the 1926 original—and a new lease on life. The Art Deco Era theater now hosts everything from discussions with celebrated authors to tribute bands. Across the street, the modern Overture Center for the Arts is a similarly all-purpose stage. What common thread could possibly connect the Children’s Theater of Madison and the self-deprecating comedian Maria Bamford, Broadway shows and jazz saxophonist Kenny G? Overture goes out of its way to offer something for everyone, including you, your four-year-old, and whoever is still listening to Kenny G during the tail end of the 2010s. When warm weather arrives in Madison, the city makes the most of it. With such an abundance of outdoors music and art during the summer months, it can be hard to decide where to start. The American Players Theater is a “happy place” for locals, who make the trek 64 kilometers (40 miles) outside Madison to the village of Spring Green, where there’s a “magical” outdoor amphitheater lit by fairy lights and plays are performed in front of a picnicking, wine-drinking audience all through the summer season. The University of Wisconsin’s Memorial Union Terrace hosts live music and film screenings—selected by students and free to the public—on its lakeside patio, where you can sip a local beer, watch the sailboats at sunset, and get hip to what the Midwestern crowd is into. For a refined high-culture experience for the masses, both the Madison Opera Center’s Opera in the Park and the Wisconsin Chamber Orchestra’s Concerts on the Square are free and open to all. BYO Blanket! For hiking with a fiery side of fall colors, drive an hour north of Madison to the glacial Devil's Lake, where 152 meter (500-foot) bluffs rise above the water and 35 kilometers (22 miles) of trails wind past spectacular sunset-hued rock formations, woods, and wildlife—including monarchs, “sky puppies” (aka bats), and Eastern Hognosed Snakes, which are non-poisonous, but put on a theatrical cobra-like performance when they feel threatened. Isn’t nature cool? The park has a trail for every skill level and locals recommend the 2.7 kilometer (1.7-mile) East Bluff/Ice Age Trail, which has stone steps winding to the bluffs, jaw-dropping views, and can be tackled in just over an hour. For a less strenuous route, the Tumble Rocks trail is a leisurely stroll along the lakeshore. If you’re visiting Madison during the chilly months, the Olbrich Botanical Gardens’s 15 meter (50-foot) tall Bolz Conservatory is a tropical paradise of orchids, free-flying birds, waterfalls and fragrant exotic plants—all housed in a glass pyramid that is wonderfully balmy year-round. Wisconsin’s reputation as a dairy-lover’s dreamland—“that whole cheese thing”—can get a bit tiresome to locals. Still, Madisonians can’t resist singing the praises of their favorite dairy-centric institutions. Whether it’s arguably the “best cheese curds” at The Old Fashioned or the “amazing” frozen custard at Michael's, a small local chain with a retro vibe, locals are rightfully proud. At Michael’s, classic custards come in three flavors daily: vanilla, chocolate, and an ever-changing flavor of the day—posted online so you can seek out seasonal favorites like Pumpkin or “Moose Tracks” (vanilla custard, fudge swirl, and peanut butter chunks). The beloved Babcock Hall Dairy Plant and Store has been serving ice cream with the same base recipe since 1951. The store has 11 regular flavors and a handful of featured offerings that may appear only once-in-a-lifetime. Catch ‘em while you can! If a midwestern town surrounded by 12 colleges seems like a good place to open a brewery, you’d be right. And Madison has more than its share of great breweries. Among the smaller, more experimental, fun-loving breweries is Karben 4, which makes seriously good beer with goofy names like Champagne Tortoise, Tokyo Sauna, and Silk Scorpion. The 32-year-old Capital Brewery is well past its adolescence, but there’s a reason this Madison mainstay has managed to ride the craft brewing revolution. While it got its start brewing Old World beers like pilsners and German-style lagers, it’s successfully branched out. Today, Capital has a good mix of contemporary American styles, its massive biergarten is an April through October gathering spot, and its sustainable practices—it’s solar powered and its spent grain feeds area cattle—give it a youthful glow. Known for its IPAs, Ale Asylum also gets the nod from locals for its food, which include an eclectic mix of worldly offerings as well as Midwest staples, including a Friday night Fish Fry. Forty-eight kilometers (30 miles) south of Madison, New Glarus is, arguably, the area’s biggest name brewery on the national scene. But here in its home state, it’s best known for its cask-conditioned Spotted Cow, which locals say is the Wisconsin beer to drink.